Microwave beans in microwaveable bowl on HIGH 6 min. Meanwhile, melt butter in large skillet on medium heat. Add shallots; cook 5 to 7 min. or until golden brown, stirring occasionally. Remove 1/4 cup shallots; reserve for later use. Add cream cheese and gravy to remaining shallots in skillet; cook on low heat 2 to 3 min. or until cream cheese is completely melted, stirring constantly. Remove from heat. Stir in milk and 1/2 cup Parmesan. Add beans to cheese sauce; mix lightly. Spoon into 2-qt. casserole sprayed with cooking spray. Top with nuts, reserved shallots and remaining Parmesan. 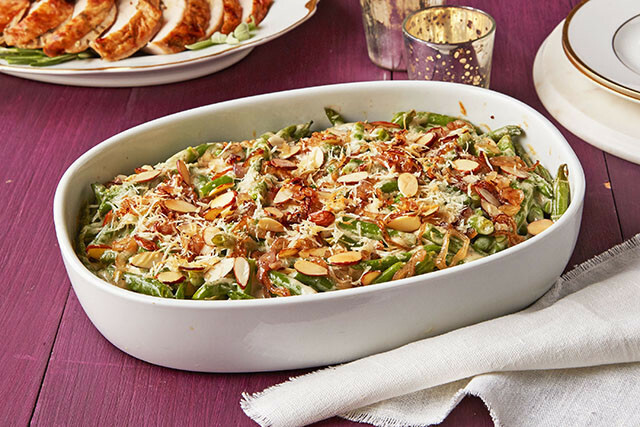 For a festive touch, top with 1/2 cup dried cranberries along with nuts, reserved cooked shallots and remaining Parmesan before baking as directed.